Saturday September 29th 1900 I worked in the fruit all day long. Will went to the fair with Charlie McCallister and after an early dinner Leonard went up town after his wife she is going to stay down here awhile to help me with the work. Weather bright today. Sunday September 30th 1900 We took an early start to go over to George Stevens. Frank and Mollie went with us. We had such a pleasant day did not get home till after dark to find the work all done and supper ready. Monday October 1st 1900 We had churning and baking on hand this morning. Leonard was cutting posts in the timber. Will and I went to town in the afternoon. Weather warm for the time of year. Tuesday October 2nd 1900 More churning to do this morning. Will went to town with some chickens I had sold and to Hills Siding in the afternoon to get Nellie shod. I was sewing on my black silk petticoat. I was down to Callies a little while before supper. 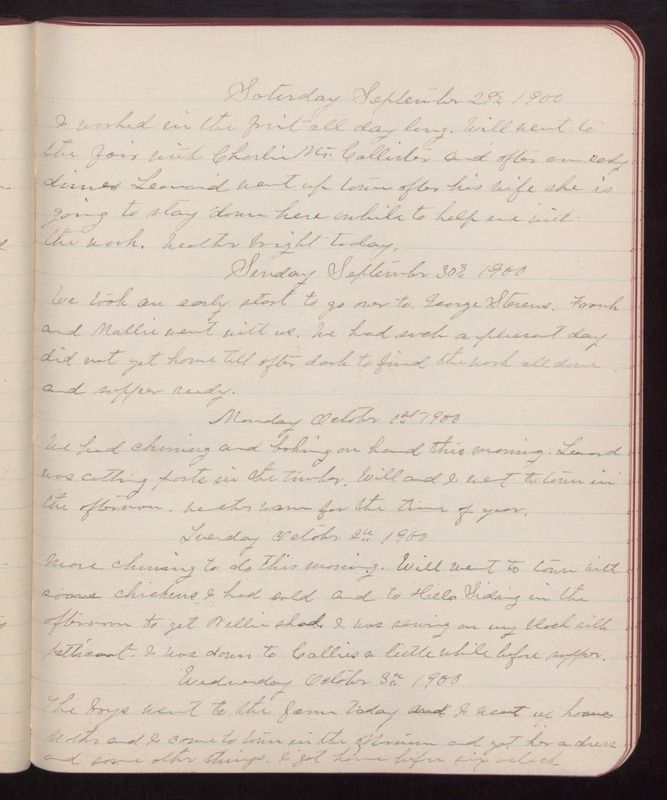 Wednesday October 3rd 1900 The boys went to the farm today and I went up home Mother and I came to town in the afternoon and got her a dress and some other things. I got home before six oclock.